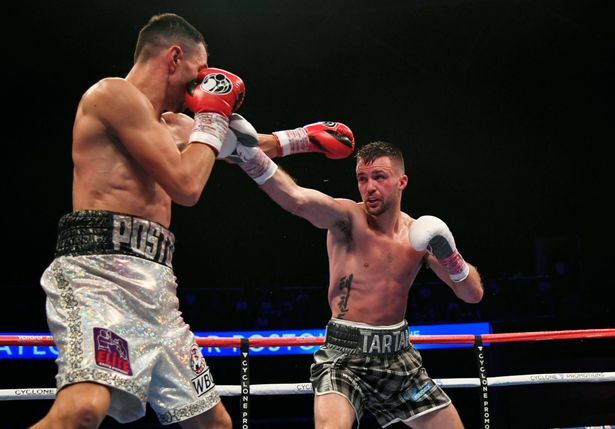 When Cyclone Promotions announced that their fast-rising star Josh Taylor was to fight Viktor Postol, few could believe it. Not because Taylor was not considered capable, but because we boxing fans are conditioned to seeing even the hottest prospects sizzle and shine for 20 bouts or more before their management even considers matching them tough. The announcement by Barry McGuigan’s outfit thus provoked a hearty round of applause from the fistic cognoscenti. 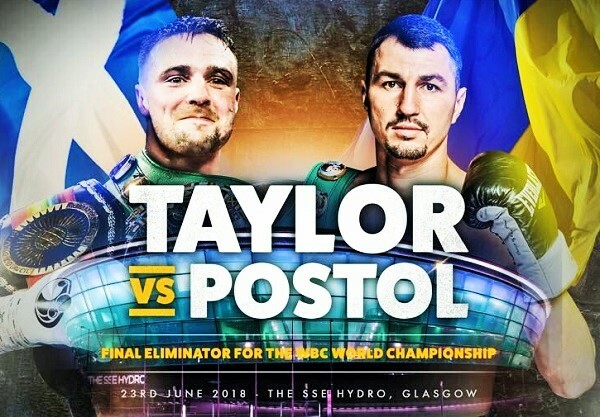 Taylor vs Postol represented both an excellent match-up and a significant risk for the young, undefeated prospect. In Scotsman Taylor we had a fighter ready and willing to meet foreboding challenges head-on, a decorated amateur turned line-‘em-up pro, closing in on a world title after just a dozen fights. While former WBC champion Postol, having beaten the likes of Yvan Mendy and Lucas Matthysse, represented a major step up in class, Taylor had eclipsed previous opponents believed to represent the same litmus test (Davies, Vasquez). More than a few felt the 2014 Commonwealth Games gold medalist was ready to firmly plant his flag in the 140 lbs division. 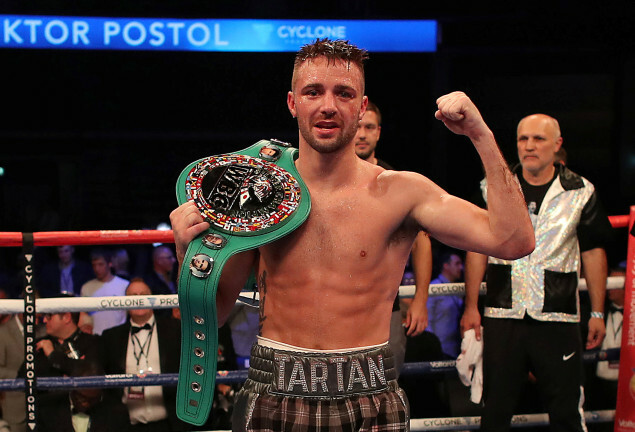 And with Terence Crawford, Postol’s conqueror, having vacated his throne in pursuit of welterweight spoils, perhaps the “Tartan Tornado” was ready to inherit the mantle. No, this was not a world title fight, but the victor would become mandatory for a shot at Jose Ramirez’s WBC strap – and Taylor’s potential appeared enormous. The contest started cagily, both intent on seizing control of the ring while being quite speculative in their offence. It was soon clear Taylor wanted to use his footwork as the literal springboard for his attacks, while Postol maintained a stoic, upright posture to punch through the younger, fresher man. The Ukrainian had the best of the opener, landing a few crisp body shots and, holding his lead left high, preventing Taylor from establishing rhythm with the jab. In the second, the home fighter settled down, driving Postol to the ropes with a clever left-to-the-body, left-to-the-head combination. Operating behind double jabs, Josh also snapped Postol’s temple with a clean right hook as Viktor backed off while trying to reset. The third was nip and tuck, Postol landing a strong right before Taylor nailed him with a left, and the battle of the jabs commenced. Taylor probably earned 10-9 due to a heavy left hook slung from the hip with twenty seconds remaining, but it was clear he had a long, hard night ahead of him. Make no mistake, Postol is the same ironman who outlasted Lucas Matthysse; through the first half of the contest his blows seemed heavier, and whenever Taylor held his feet there was an ominous feeling in the air. 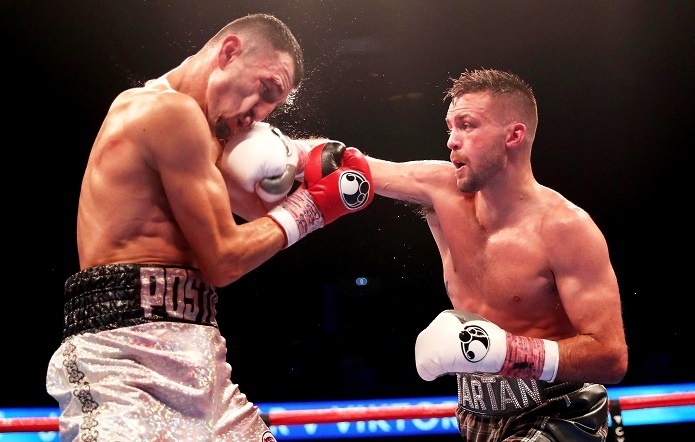 That was certainly the case in the fourth as Postol out-jabbed Taylor and followed up with hurtful combinations to the head, but in the fifth the Scotsman was extremely sharp and spent the round counter-punching to good effect. Taylor has a swashbuckling style characterised by bidirectional movement: frequent sidesteps left and right, regular ducks and slips, a swivel here, a lean-back there. He looks like a nightmare to box, because you have to concentrate fiercely on both pinning him down and avoiding his accurate counterpunches and devious body shots. A painful nuisance, you might say. Not that Postol seemed to care; he probably has one of the top three poker faces in the sport. He continued to go about his work with minimal fanfare, like a skilled tradesman chipping away with outmoded but effective tools. But Taylor sneakily popped him with a right uppercut in the sixth that sent him back-pedaling and followed up with a sweeping hook as the veteran slid along the ropes. Buoyed by the knowledge that Postol could be hurt, Taylor marched arrogantly forward behind the barricade of his gloves, upping the intensity and seeking the finishing blow. The jabs weren’t working too successfully but, he seemed to be saying, they weren’t important: he’d land lead hooks from the southpaw stance, fire straight lefts between Postol’s guard and continue to break him down. Assertiveness entails risk, though, and as they met at ring centrePostol put together a left uppercut with a left hook that visibly hurt Taylor, causing him to retreat. This was like a red rag to a bull, and Postol pressed forward while his stunned prey circled to clear his head. Having such great wheels comes in handy, for Taylor saw out the seventh quite comfortably. In the eighth the pace slowed, both seeming to recover from the previous round’s exertions, but Postol edged it with some commanding body punching. That was his last round on my card, however: in the fight’s final third Taylor – who had never before gone past nine rounds – grew in stature and, incredibly, grew in strength. 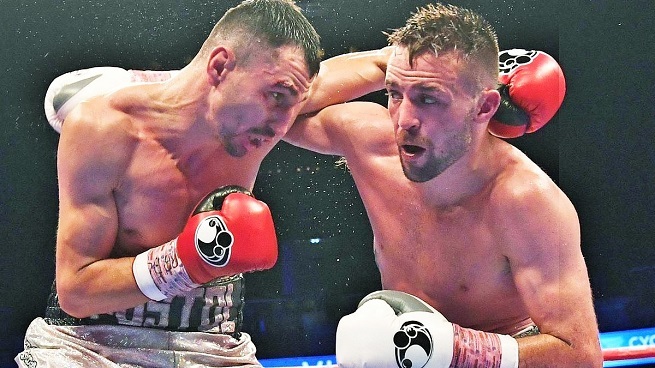 It was quite something to witness this prodigious countryman of mine go through the gears, buckling Postol’s legs, bullying him onto the ropes and visibly draining his gas-tank as the body attack started to pay off. At the conclusion of the ninth he probed with a jab, stepped back as Postol launched a right, then exploded a sickening counter on his chin. The ironman stumbled into the ropes and was saved by the bell, though he rallied impressively in the tenth. That is, until Taylor countered a lazy jab with a colossal left hook which dropped Postol heavily. Again, the bell was his saviour. In the championship rounds Postol’s central nervous system took a pounding, as an improbably fresh Taylor delivered crunching lead left hands, body shots and uppercuts. 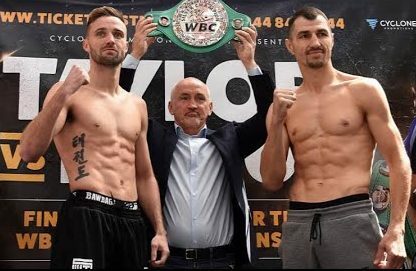 Postol continued to have moments, biting on his gumshield and doing what he could to turn the tide, but the die had been cast. It was the night of the younger man, the Tartan Tornado whipping up a frenzy in front of a rollicking home crowd, and though the scores of 118-110, 117-110, 119-108 were unfair on Postol (I had it 116-113), JT proved he’s a force to be reckoned with in the junior welterweight division. A terrific fight typified by outstanding gallantry from both combatants, this one surely answered any questions naysayers had about Taylor. No, he is not just a flashy frontrunner; he is celebrated on these shores for a reason, and to his natural talents we can add gameness, stamina and intelligence. In the post-fight press conference, Taylor claimed we only saw him “at 70% tonight,” to which Barry McGuigan nodded vigorously. If that’s the case, Jose Ramirez better find a good strongbox for his WBC belt. The sky’s the limit for Taylor. 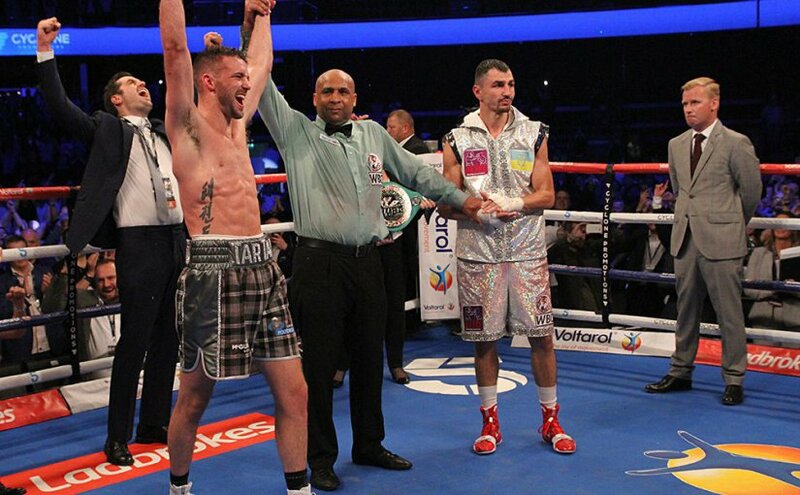 On a separate note, it’s great to see Taylor replace Ricky Burns as Scottish boxing’s standard bearer. Burns was and is a brave and admirable character, as well as an underrated fighter. But he is on the home stretch of a fantastic, overachieving career and Taylor – blessed with more natural talent – is the perfect successor. Maybe one day we’ll bracket him not just with Burns but with Buchanan. 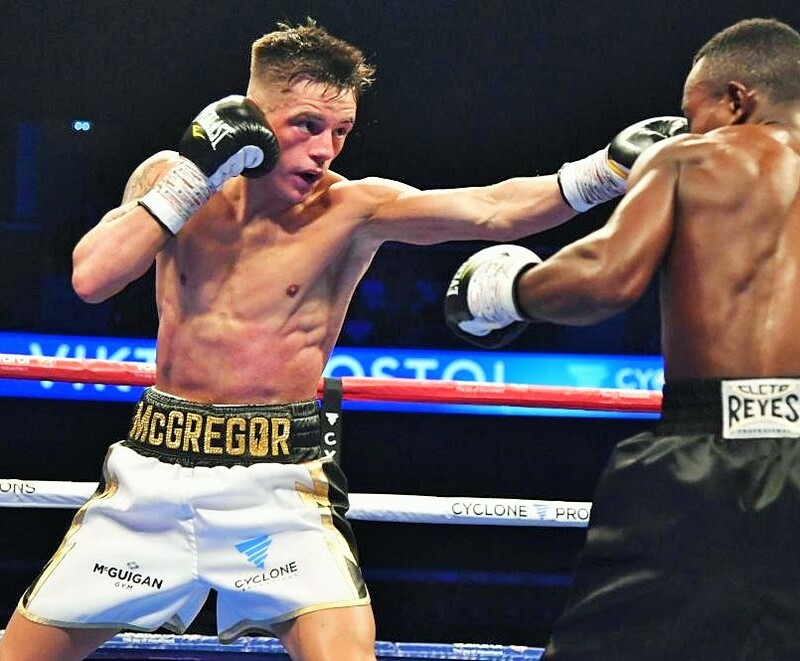 This was my second opportunity to see ‘Lightning’ Lee McGregor, another of Cyclone’s bright lights who picked up the vacant IBF Youth Bantamweight title with victory over Tanzania’s Goodluck Mrema. McGregor, now 4-0 with all wins coming by KO, is a spiteful little box-fighter with an impressive range of punches and an aptitude for distance-control that belies his inexperience. It didn’t take him long to cut down the vastly more experienced Mrema (22-3), rendering him unconscious with a frightening series of left hooks in the fourth. In fact, the African – whose recent fights had been contested closer to the super-bantamweight limit – lay sprawled in the corner, his head cradled in the bottom rope, till he was hoisted to his feet and planted on a stool. Then a well-meaning doctor attempted to force an oxygen mask on his face, to no avail; Mrema was only just regaining lucidity but he was far too proud to have a stranger clasp an oxygen mask to his face. Eventually, compelled by his handlers, Goodluck permitted the Good Doc to do his thing and, next thing, the MC was announcing McGregor as the new champ. It was another eye-catching demolition job from the 21-year-old, a four-time Scottish amateur champion. Watching him progress should be fun. Elsewhere, Cyclone’s heavyweight hope Martin Bakole (11-0) took care of business with a one-round bludgeoning of DL Jones. 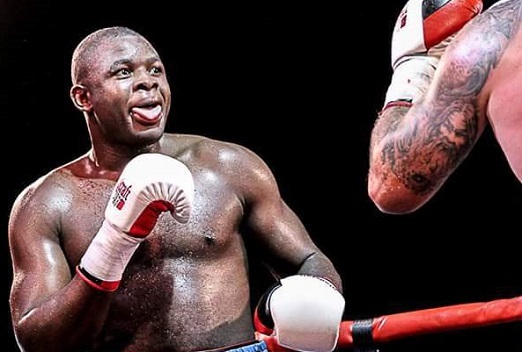 The gigantic Bakole, who hails from the Democratic Republic of Congo but now lives in Airdrie (an industrial town 12 miles outside Glasgow), is part of a booming domestic heavyweight scene. Anthony Joshua is the world-beating behemoth, but behind him there’s Dillian Whyte, Derek Chisora, Tony Bellew, Hughie Fury and, further down the pecking order but steadily climbing, Joe Joyce, Daniel Dubois, Nathan Gorman and Bakole. You can’t read too much into tonight’s win, particularly since Bakole outweighed light-hitting Englishman Jones by 30 odd pounds. Having said that, the protege of Ricky Burns’ old coach Billy Nelson did what he was supposed to do in good style, twice dropping Jones heavily within the first minute. Bakole has sparred many of the aforementioned names and will be keen to trade with them in the near future. Rumour has it he worked over fellow unbeaten prospect Dubois in the gym only last week. Whether true or false, Bakole – whose half-brother is former cruiserweight champ Ilunga Makabu – is a good addition to the domestic scene.